I think my wife wants a divorce. 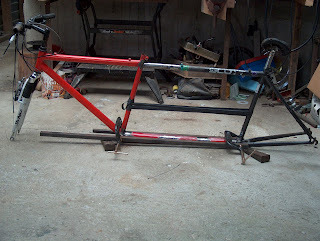 She has given me permission to build a tandem. - Actually she didn't give me per.. - I just got some mountain bikes and got on with it. The way you make a tandem is this. First you re-read Martin van den Niewelaar's article in the Feb 2008 newsletter of KiwiHPV, and then you re-read Sheldon Brown http://sheldonbrown.com/tandem-build.html, and then you re-read John Allen http://www.bikexprt.com/bicycle/tandem.htmand then you head for the dump at Mariri. With a name like Martin van den Niewelaar you are required to live in Christchurch which is reassuringly flat. You're 1.8 metres tall, and the person who's (probably) thinking about divorce is a 1.6 metres tall fully trained German violin maker http://www.violin.co.nz/links.shtml which I still find difficult to believe. What are the chances of finding a fully trained female German violin-maker in a country with a population the size of Birmingham? - As a matter of fact I bought an old Stradivarius in a junk shop here, signed with the date - 1776 - written in by hand, a trifle baffling since any reputable forger would know Stradivarius died in 1737. - What's odd is it does have a nice tone. - What's odder is it's a 15/16 size, so if anyone's a particularly small violinist in need of - anyway, this isn't getting us very far. Most of making a tandem comprises worry. You worry about meaty front forks. You worry about cutting the wrong bits of rear stay off. You worry about whether 36 spoke MTB wheels will be up to it, and you worry about the geometry going wrong because you've cut a bit of tubing either too long and you can't be bothered to file it exactly to size or that you've cut it too short and the finished thing will look like a hog. Most of my time is spent saving fivepence by splicing bits of tube together. I do this because whenever I see a sawn-up bike frame I think about how long it would take me to mine the ore, smelt it, and come up with a perfect piece of tubing. Making tubing by hand is astonishingly laborious. When the first gas pipes were laid in England, gunmakers were the only people who knew how to turn a lump of iron into an air-tight pipe (clue: Damascus barrels), and it is reported that the first gas-pipe was musket-barrels welded end to end. When once you know a thing like this you can't ever bring yourself to cut into a 20 foot length that you keep for just such purposes. 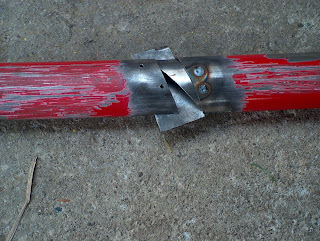 Oval tube prior to splicing. Preparing the donor frames mostly comprises removing bottom brackets. 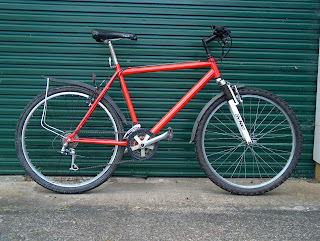 I advance the Middleton Theory, which is that there is a mischievous elf who goes around with a spanner tightening pedals, stripping the thread in cranks and hammer-forging the right-hand cup into the BB shell and when he's done with all that, he pours dilute zinc chloride into handlebar stems. Come to think of it, John found his spanner. Hah! Where's the Araldite? Two can play at this game. He'll be amazed at how irritating it is to find a washer epoxied all the way into the lock of his ute. Two perfectly good gentlemen's mountain bicycles, shortly after coming into my care.